I read a blog post yesterday that fascinated me. Carol wanted to improve at drawing cats, and so she followed the advice of a teacher: “If you want to get really good at something, you must draw it at least 100 times.” This had my head spinning yesterday wondering what subject could be worth drawing 100 times. While talking to my sister (the artist), it came to me. Beach art! That’s what really jazzes me. It’s what I love most, and what I want to share with the world. Who’s with me? What’s worth drawing 100 times to you? Let’s get this paaaahty staaaaahted *cue the dance*! Hmm…I need a break from 100’s after I finish the grids (tomorrow!). But I’ll definitely be doing another (although less every-day rigid) at some point. This is really beautiful, I especially like the texture in the dunes. And you do have a feeling for the sea. I enjoyed that post about the cats, too. And I always enjoy your replies! Thanks, Nicola! I enjoyed doing this one. Small paintings are less of a commitment, and less pressure. Especially when time is limited! It’s working well for me so far. I saw that! I can’t imagine filling a large piece of paper. I don’t have fear of the blank page, but I think if the page were large, I would! I give artists like you lots of credit! My biggest pictures are still only a bit bigger than A4. People tell me that’s still quite small and lots of people seem to work at least twice the size of that as standard. I would really like to see some of those for real instead of online – shrunk down to blog photo size they look wonderful and detailed but perhaps that’s a false ideal I’m setting up for myself because actually they’re much larger in real life. My recent tiny pictures look so wobbly and scruffy but then the photos online are actually bigger than the real thing! Yeah, you make a great point. Very hard to judge based on the photos we see on the screen. This is an exciting concept. Go, D! Does this mean if I exercise 100 times I will no longer feel the fear? I have been wanting to return to my artistic roots. Fear has to be the culprit. Thanks so much, Rebecca, I appreciate that! I don’t think I’ll be doing a beach subject every single day, unless I feel led to do it. I don’t want to make myself sick of them or feel pressured and squelch my passion for them. But I like having that goal in mind, and, maybe because numbers is my ‘day job’, it’s just nice to have that figure in mind – the idea that once I do 100 pieces of beach art, they might actually be decent paintings? And maybe they won’t, but at least I’ll be progressing toward what I feel is my “dream” at this point (which is to work at the artist’s coop at the beach where I like to vacation – which I would either need to retire or move house to ever be there, since it’s 7+ hours away lol). The whole thing seems crazy, but I still think it’s a little nutty for me to be so obsessed with making art every day. It won’t let me go though, so as long as the flame exists, might as well pin a goal or two to it! Laura, I love it. I love lighthouses and seascapes. They’re my favourite thing. I’d buy that piece there off you right away once you open that etsy shop. You should look into getting prints done as well and maybe turning them into greeting cards, y’know that type. It will be really cool if you could pin them all to a wall or something each day and see your progress day by day. Never heard of Blutack, but I guess it makes no holes? Sounds great! Thanks! I love to see lighthouses! I think that it would be a pleasure to keep drawing (and painting) them. I love them too, Margaret! Thanks! Thank you, Jane, I appreciate that! Faces would be great too. 100 faces! That’d be loads of fun! It really works as a piece–the grasses emphasize the vertical, and the L composition along with lovely sky interest and free-hand drawn subject creates movement while integrating the choice of pallet (i.e. the colours work well together) and give us a sense of being there in the moment. Thank you, Lance! Your analysis is very helpful for me also. I used a photo reference in this case but some happy accidents along the way mean that I don’t think the photographer would recognize his/her photo. But again, much of the composition work was done for me. I always appreciate your feedback. I’m cheering you on Laura! Today’s watercolor is a beautiful beginning. Yay!!!! I was thinking about faces too! Have you ever heard of a 5-minute head study? I’ve been watching tutorials on Artist Network TV. I tried one last night; it was fun! That’s pretty easy to fit in to any schedule. Wow, that’s cool that you started with faces!! I hadn’t heard of that, but I do love tutorials. I will check it out. Thx Laura. Lol are you gonna go for it? Your work is already Etsy-worthy! Oh yeah :-). I’m a little turtle with opposable thumbs. Hmm… maybe I’ll be Etsy-worthy after 50 birds – still a few nose-wrinkling kinks to smooth out. And I’m going to try out your small drawing strategy. I’m working with 5.5 x 8.5 inch paper right now. Next time, I’m going to use 1/4 of that size. Speed the turtle up a bit. great ambition! Do it! I’m looking forward to seeing it too. You keep improving and pushing yourself and skies the limit! 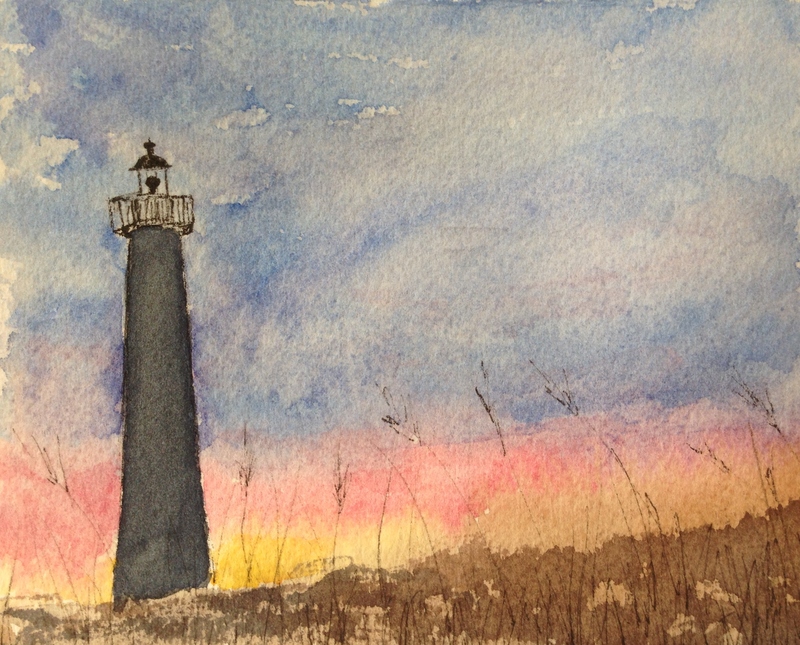 Lovely scene – always great to see lighthouses! Nice work Laura. Laura, I”m impressed. this is really nice and good for you for painting every day in July! when I did that in January it really kickstarted my painting. Wow, this grass looks so real! Great job, Laura!! !